Fall brings the changing of of the colors to Boulder Mountain. Conditions are near perfect for hiking. September is a spectacular month to visit the area. Daytime temperatures are in the 70’s and 80’s and nighttime temperatures are in the 40’s and 50’s. The insects have diminished significantly. 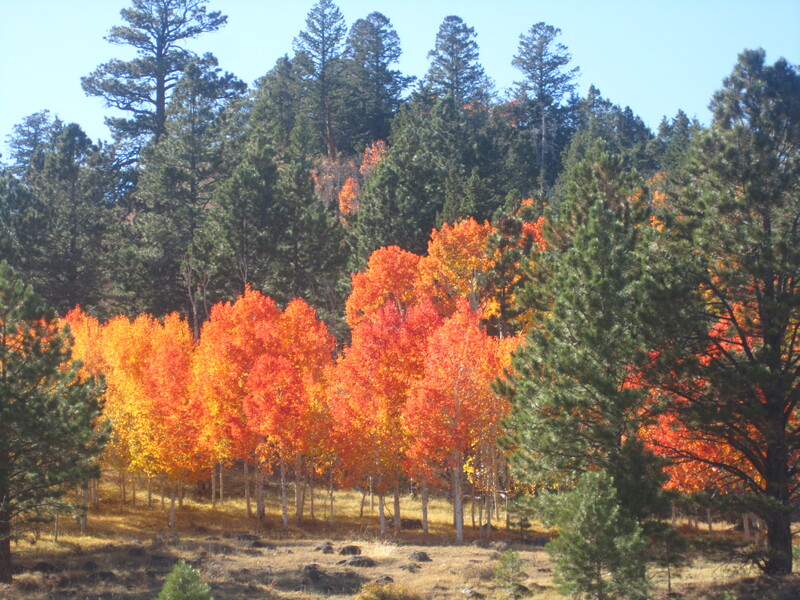 September holds the most promise for spectacular Fall colors are in the desert and on the mountain. Upper Sonoran Zone – Hiking in the desert and on the slickrock is spectacular. Riparian Zone – Hiking the riparian zones is spectacular. Flash floods are still possible, however the rainy season has diminished significantly. 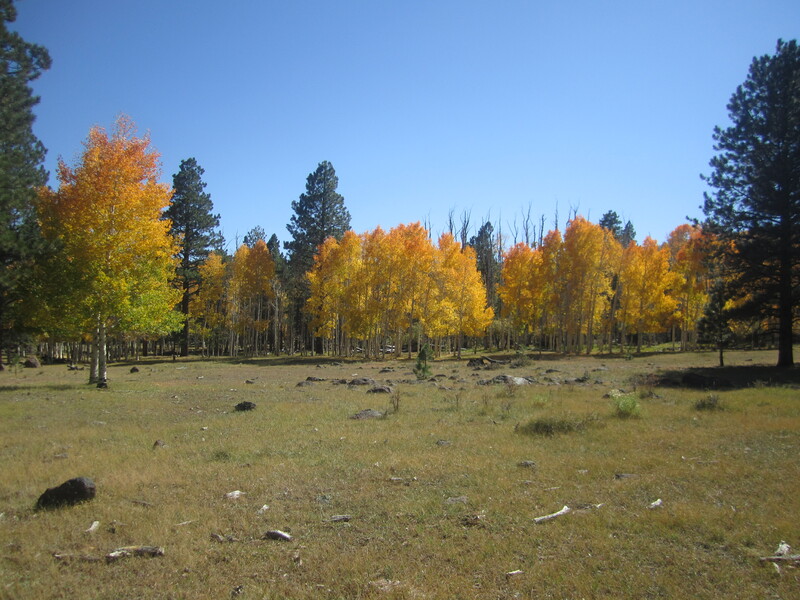 Transition Zone – Hiking the ponderosas is splendid. Canadian Zone – Hiking the aspens is spectacular. The aspens are changing colors. Hudsonian Zone – Hiking the mountain top is still splendid, however the temperatures are dropping. Snow storms are a possibility. Recommended hiking — Take your pick of Slickrock Hikes, Rim to River Hikes, Riparian Canyon Hikes and Boulder Mountain Hikes. They are all excellent at this time of year. October is the month of crisp clear air. The days are mild in the 70’s and the nights are in the 30’s. Nature is getting itself ready for winter so the animals are active. The insects are gone and the water temperature in the river and streams is dropping but still not to cold. Hunting season is in full swing so wearing bright colors while hiking on the mountain is a good idea. Riparian Zone – Hiking the riparian zones is spectacular. Flash floods are still possible, however the rainy season is essentially complete. Canadian Zone – Hiking the aspens is spectacular. The aspens may still have changing colors. Hudsonian Zone – Hiking the mountain top is still splendid, however the temperatures are dropping. Snow storms are likely. Hiking in the Transition Zone in late November. Crisp cool days make for relaxing hiking. November is a peaceful month for the trails. The day time temperatures are in the 50’s -60’s. The nighttime temperatures are in the 20’s and 30’s. Most of nature is ready for winter and is merely waiting for the snows to arrive. Hiking is great since the temperatures are mild and the weather is frequently calm. The sun is low in the southern sky making the colors of the canyons more vibrant. The elk hunting season is in effect though a large percentage of the hunters have left the mountain. Riparian Zone – Hiking the riparian zones is good. The water crossing may be getting frigid. Transition Zone – Hiking the ponderosas is splendid. Thin snow may cover the ground. Hudsonian Zone – Hiking the mountain top is nice, however be prepared for winter conditions. Snow storms are a possibility. Recommended hiking — Slickrock Hikes, Rim to River Hikes, Riparian Canyon Hikes and Boulder Mountain Hikes are all generally good hikes for November, however weather conditions and water temperatures in the streams and creeks that require water crossings will be the determining factors as to the best locations for hiking.